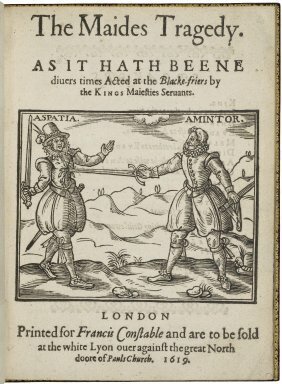 AS IT HATH BEENE diuers times Acted at the Blacke-friers by the KINGS Maiesties Seruants. LONDON Printed for Richard Higgenbotham and are to be sold at the Angell in PAVLS Church-yard. 1619. Title page imaged from Folger call number: STC 1676. Image is not from the transcribed copy.